1) The servers have been rock solid. There were no server crashes at all. 2) The mix of NPCs and players have worked great together. We’ve been happily stressing the rendering component of our engine as well as client networking. 3) We’ve uncovered at least one issue with VFX, which we think was causing the worst of the lag spikes. The good news here is that even with those spikes, the game kept running, and then when the spike ended, everything was just fine until the next spike. *Update*: We found the problem, put an band-aid on it, and it worked great. Fixes will be coming next week. 4) In general, the game performed up to expectations.So, the first Alpha test that we’ve had in many months was fun, successful, and a great and important step forward. Thanks to everybody who joined us for it! Expect more next week! If you missed today’s live stream update and Q&A with Mark, you can catch that HERE. In terms of the rest of the week, let’s take a look our highlights! WIP – Production – Beta Schedule: We recently completed a good portion of the work we need to do in order to announce the Beta 1 date. As we’ve said previously, we’re taking our time to get this right. Our goal is to provide our Backers, as well as ourselves, with a solid “Road Map to Beta 1”, which includes the Beta 1 date. WIP – Tech – Testing: We’re thrilled to welcome our Alphas back into a stability-focused test. 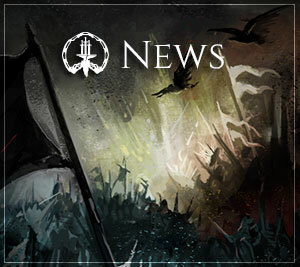 This test helped us track down new issues, as it was intended to, but also allowed us to show off small (by own standards) scale battles, with NPCs and players in the scenario system! 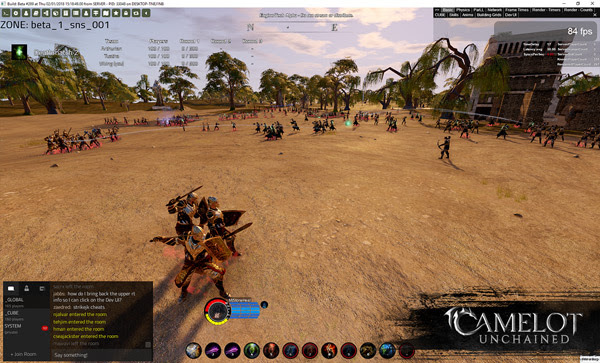 The battle was 100v100v100; a glimpse at where we are going with the large-scale battles which only Camelot Unchained can deliver! Tech – Stability: Our next milestone focuses on stability and performance, but we’ve already gotten started on that. Several people assisted this week by finding and fixing several network and client crashes, allowing us to push a more stable build out for testing, as mentioned above. WIP – Tech – Active Queue UI for Skills: AJ has begun work on a new addition to the UI. This will show what skills are queued/preparing/held for other skill tracks in a separate widget from the skill bar. Examples of skill tracks might be PrimaryWeapon, SecondaryWeapon, Voice, Mind, etc. WIP – Tech – Polyamorous Editor: Bull’s end goal with our editor is to allow it to carry on a relationship with both local and and remote files. All joking aside, Bull is working on the first task of several to meet that goal. Doing so will unlock several features we’ve wanted the editor to support. In the short term, this will make Ben’s life easier when editing abilities. WIP – Art – UI Animations: After handing off the updated patcher animations last week, James has finished a round of necessary fixes this week, and is wrapping up the Victory animation as well. The latter item will be part of the next milestone with the new scenario. 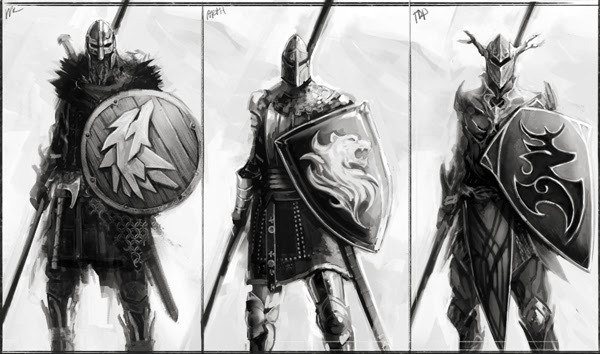 WIP – Art – Patcher Splash Screens: Michelle shifted back to her trio of SNS splash screens for the patcher this week, and has begun sketching new concepts for race-specific animated backgrounds during character creation. 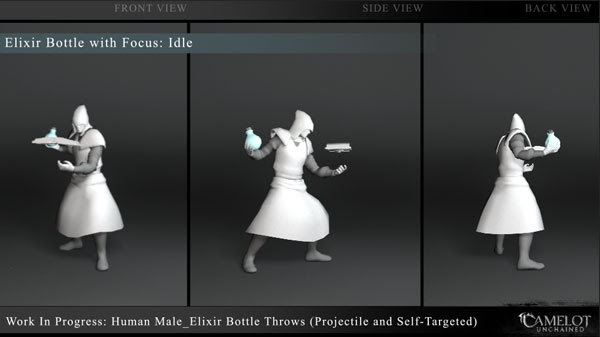 WIP – Art – Updated Throwing Animations: Included in this week’s update, you can see the new pass on throwing animations from Scott. These are still WIP, and are meant to bring the very old animations up to par, and prep us for more focused work on the Physician class. Art – Character Creation Renders: Sandra, after a brief bout with the plague, is back to work finishing the character poses for character creation. Michelle and Sandra are working great as a team, iterating on the poses to not only personify the classes, but Realm and race as well. Sandra’s favorite character to pose seems to be the plucky Luchorpán. WIP – Art – Characters 2.0 – UVs and Materials: Starting last week with Jon’s comparison shot of the old and new character UVs, we’ve begun investigating many different ways to improve our characters. 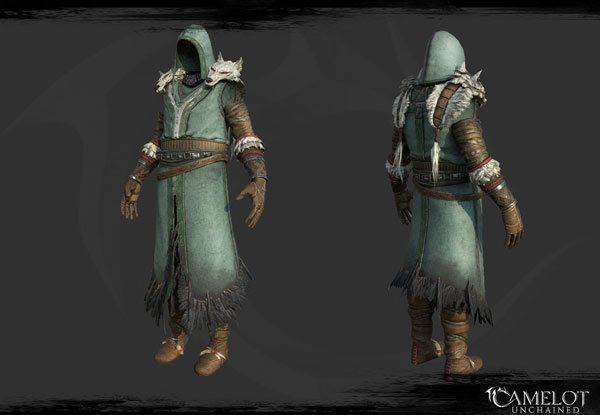 This week, Jon finished an update of the Viking light armor with new materials and UVs. Additionally, he’s using this time to update our old glove models and heads. WIP – Art – Characters 2.0 – Geometry and Mesh Weights: Joe has been attacking several issues on our radar to improve our characters. This week, he spent time investigating all our armor parts and looking for ways to reduce geometry penetration when animated. Of particular note, he’s looking at ways to improve how we rig our pauldrons, which don’t look so great when using wider arm movements. He’s also working on scripts to help the animators update and use our rigs in Maya, and exploring mesh weights to reduce pinching. WIP – Art – New Stonehealer SFX: dB took a break from debugging earlier this week, and started on some new Stonehealer-specific sounds. Check out his stream HERE to see how it’s done! Several cool items in this week’s highlights! Let’s move into art for the week, starting off with a link to some of Scott’s updated throwing animations he’s been working on. As mentioned above, these are still works in progress; the next iteration be a lot more fleshed out. These guys do a lot of throwing in their class abilities! Catch Scott’s stream from earlier this week HERE. Once in a while, Tyler finds some time to do a little art. 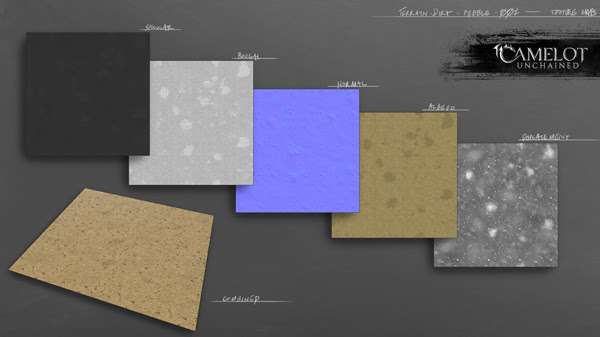 Here we have a breakdown of one of the new terrain materials to be used in the new scenario map with the Place of Power model. As mentioned in Top Tenish, we showed a side-by-side comparison of Jon’s changes to the Viking medium armor with a new UV layout last week. This week, we have that same comparison, but in-game, in our engine! Notice how much easier it is to see the details in the left-hand version, which is the new one. This is visible not only in the textures, but also in the mesh, which makes better use of the geometry to pull out those details! 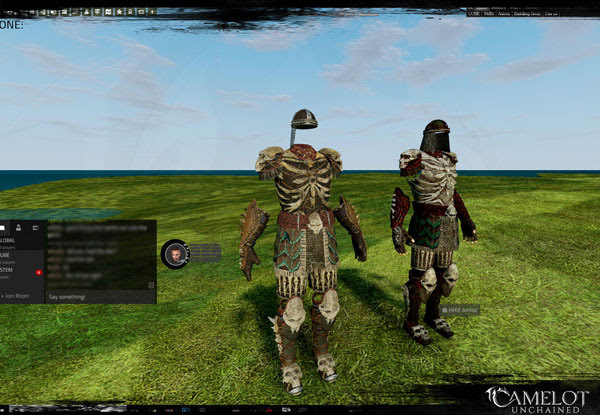 Here’s Jon’s work on the Viking light armor, using the same layout to improve visual fidelity. What a difference! Next we have Michelle’s work in progress on new Realm-themed splash screens for our future SNS battles. These will next go through a UI layout pass with JB, and eventually become animated by James! 1) As always, other than adding the Camelot Unchained tag, these screenshots have not been altered in any way. 2) If you look at the top right of each shot, you’ll see how many players/NPCs the engine was networking and rendering at the same time. 3) If you look around in the background, you’ll see how ridiculously long our render distance is. Can you spot all the Alpha/IT players and NPCs that are in the shot? 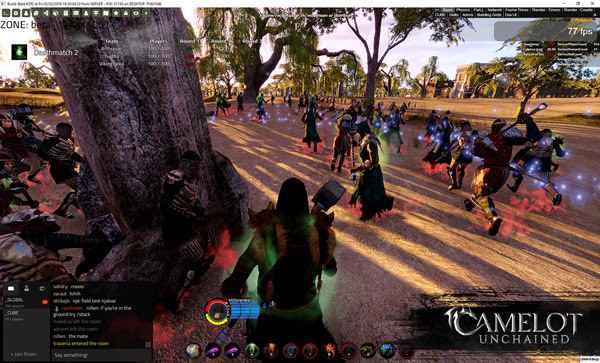 Look around very carefully, and think about the last time you played an MMORPG where you could see players and effects as far away as you can in our game. Folks, it just gets better, so much better from here! As always, we thank you for your support and patience. I look forward to being your practice dummy in RvR this month and beyond!